If you’ve ever been involved in a car accident, you know it can be a stressful situation that isn’t limited to the accident itself. The stress continues as you deal with car repairs, dealing with the insurance companies, and in some cases going to court. While these issues can usually be resolved in a relatively short time frame, the stress resulting from an auto accident can have long-lasting effects, in many cases. For many people, auto accidents can be the source of physical injuries, sometimes minor and sometimes major, depending on the severity of the accident. However, the severity of the accident is not the only factor with which auto accident victims should be concerned. The level of stress an auto accident victim encountered in the time following the accident can have a significant impact on the risk of developing long-term symptoms of whiplash. In a study of patients who had recently been involved in an auto accident, it was discovered that patients who had high levels of initial pain and showed signs of Post-Traumatic Stress Disorder (PTSD) were more likely to suffer long-lasting symptoms of whiplash. 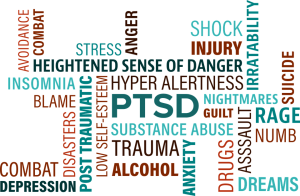 Post-traumatic stress disorder (PTSD) is a mental health condition that’s triggered by a terrifying event — either experiencing it or witnessing it. Symptoms may include flashbacks, nightmares and severe anxiety, as well as uncontrollable thoughts about the event. In addition to long-lasting symptoms, patients who showed signs of PTSD after an auto accident showed observable changes in their neck muscles. Not only did the accident cause damage to the spine, it also created an unhealthy stress reaction which may have led to pathological changes in the neck muscle tissue. The key to preventing chronic whiplash pain following an auto accident is early intervention. Chiropractic treatment can help the body’s healing process following an auto accident (and in a vast number of other situations!). Treatment from a chiropractor can also help return the neck to its normal, functioning state. Additionally, chiropractic is a proven method of reducing stress, which can reduce the chance of developing chronic neck pain following an auto accident. If you or someone you know has been experiencing neck pain following involvement in an auto accident, give Advanced Chiropractic & Rehab a call today at (330) 726-7404 to schedule a free consultation to see how we can help. We have been servicing the Youngstown and Mahoning Valley area since 2001 with convenient locations in Boardman and Hubbard. At Advanced Chiropractic & Rehab, we are a multi-disciplinary rehabilitation group that treats work comp injuries, whiplash, sports injuries and specializes in much more than just low back pain.